On Thursday, the National Right to Work Legal Defense Foundation petitioned the Supreme Court to review Bierman v. Dayton, a case challenging exclusive union representation. The case was filed on behalf of home health workers, including a mother caring for a child with cerebral palsy. The aides claim that they have been forced to surrender their representation rights to labor giant Service Employees International Union Minnesota Healthcare despite the fact that only 13 percent of workers participated in a 2014 mail-in representation election. "For those who do not want that union speaking on their behalf, exclusive representation results in a ‘significant impingement on [their] associational freedoms,'" the petition says, pointing to the Court's June opinion in Janus v. AFSCME. "SEIU's authority to speak for providers necessarily associates them with SEIU and its speech." The Right to Work Foundation has scored several major victories before the Supreme Court in recent years, including successfully overturning an Illinois scheme to force home health aides to pay union dues in the 2014 Harris v. Quinn case. The group also represented government workers in Janus v. AFSCME, which successfully overturned longstanding precedent in public sector unionism. In June, the Supreme Court ruled 5-4 that forcing government employees to pay union dues or fees as a condition of employment violated the First Amendment rights of workers. The lawsuit was rejected by the 8th Circuit Court of Appeals. That court held that SEIU's representation of the state's 27,000 home health aides did not violate the First Amendment rights of any dissenting caregivers. 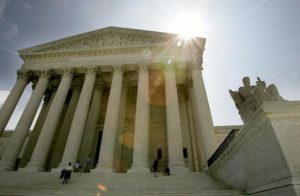 Appellate judges acknowledged the Janus ruling in its opinion, but said the Supreme Court only addressed the financial aspect of coercive unionism, rather than the concept of monopoly representation, in which a state only recognizes one bargaining partner during contract negotiations or disputes over work conditions. The 8th Circuit affirmed the constitutionality of allowing a single union to represent a diverse workforce provided they abide by state and federal labor policies. It also pointed to SEIU Minnesota's stated position that it "would not seek mandatory fees from providers who did not join the union," as another factor differentiating it from the Janus case. "Under those decisions, a State cannot compel public employees and homecare providers, respectively, to pay fees to a union of which they are not members, but the providers here do not challenge a mandatory fee," the appeals court ruled. "The constitutionality of exclusive representation standing alone was not at issue [in Janus]." The plaintiffs argue in their Supreme Court petition that the reasoning behind Janus should extend to monopoly bargaining. Government agencies should not outsource the input of individual citizens to a favored labor organization. Home health aides, the foundation says, are treated as if they are government workers in violation of the Harris precedent when in fact they only receive reimbursements that are set by federal authorities. While the High Court has held that the public sector can grant exclusive representation if it demonstrates a "compelling interest," the Bierman plaintiffs argue that "no such interest justifies extending exclusive representation to individuals who are not full-fledged public employees." "The government cannot be allowed to dictate, on any mere rational basis, which organization speaks for individuals in dealing with the government. The First Amendment reserves this choice to each individual," the petition says. The fallout from the Janus decision has led to a number of class action suits in states across the country from workers seeking to reclaim their back payments. National Right to Work Foundation President Mark Mix said the Minnesota case will help bring resolution in the dispute between dissenting workers and labor groups at the state and local level. "If the Supreme Court agrees to hear Bierman, these home care providers will be one step closer toward ending an unconstitutional scheme that forces them to associate with a union they oppose as a condition of state assistance in providing care for their sons and daughters," he said in a statement. "Forcing individuals under union monopoly representation flies in the face of the First Amendment's protection of freedom of association." The union did not respond to requests for comment.